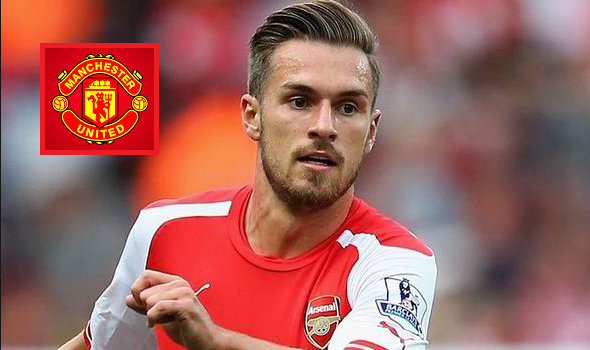 Manchester united plot of £50 million bid for Arsenal star Aaron Ramsey. After Mkhitaryan the new coach Mourinho set his target on this Arsenal midfielder. According to source if United unable to pocket the Borussia Dortmund midfielder in summer windows, they will confirm the premier league club midfielder. Ramsey is a Welsh professional soccer and plays on midfield. Some times he is seen to play in forward and that’s why he also called as winger. The 25 years man joined Arsenal in 2008 for £5 million bid. It was a long time deal with the club. The midfielder made two times move on loan Nottingham Forest and Cardiff 2010 and 2011 respectively. After that he joined again in Arsenal. The premier league pool round have already finished and soon the knockout stage will be taken place. After completing the full tournament the transfer process will be started. Borussia Dortmund first rejected the transfer offer of Mkhitaryan to Red Devils side. But Mkhitaryan’s own interest in United side force Dortmund to release him. Mourinho desperate to borrow the Borussia winger but if the deal cancel by any means, they will pick Welsh right winger in their side. Ramsey is very talented footballer in premier league competition. His artistic playing system and ball controlling method really prolific.The midfielder is well known for his hard working and fast run. At present the right winger Ramsey has been existed in a high form on UEFA Euro 2016 season and his contribution and attempt boost Wales to complete above the England in pool B. He is a mastermind midfielder at all. His quality and capacity really worthy of accolade. According to report the midfielder yet not showed his expression about the trend rumor. He keep quiet silent and have not pressed any word. The most interesting fact is that the Gunners also have not sounded to move for the midfielder. Aaron is still under the Arsenal contract which will be ended in 2018 summer. Now total matter depend on the Gunners club. If they release the winger in summer, Man Utd can take him in his side otherwise the deal is not possible at all. Actually the move yet not confirmed and also depend on Borussia winger. Mourinho is desperate to take him this season who wished to give a new shape of Manchester United line up. If the deal have completed, it would have not needed to complete the move of the Welsh professional.